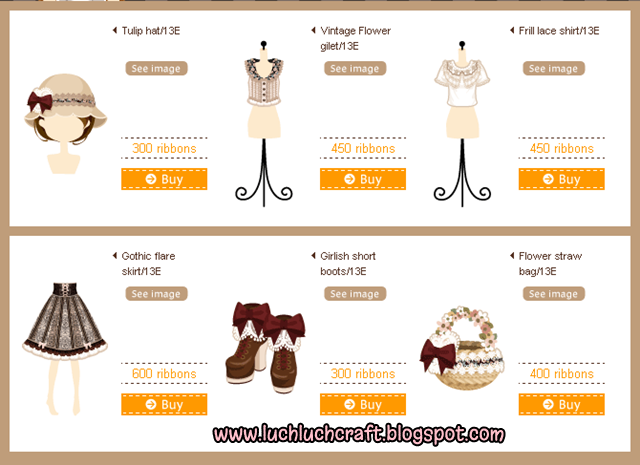 Luch Luch Craft: POUPEE: Platinum Secret Room 2013. YOU MUST CHECK! POUPEE: Platinum Secret Room 2013. YOU MUST CHECK! Just a quick post to let the Poupee girls know that.. THE SECRET ROOM is here!! In case you didn't get the invitation cause this secret room is only for people how know the link to it. I got message from Kathrine but My sister's poupees got the same message..
but I bought it later in Poupee market with double prize >.> god..
anyways this is what they sell! Opps sorry I talk too much. I said quick but it's longer than I think.. So this is what Katherine said.. Thank You Guys So MUCH! And I really appreciate you're playing Poupeegirl. Do you know the Platinum secret room? My friend, Natalie, she's going to open up our secret shop for a limited time and for a limited number of Poupeegirl’s!!!! You know, you've got this message so.....it means you have invited to this fabulous shop! Yay! A shop which sells special dress up items which only some special users who are invited can shop. * Please note that the time of items sold might differ a little. * Please also note that at the time of the campaign, you might feel difficulty accessing to poupeegirl. If you haven't join my giveaways. Feel free to join it. YOU MIGHT BE THE LUCKY WINNER! If you play poupee, what do you think about this year secret room? But I also don't like the stuff. The prices are really to much for such odinary clothes. I still have the ribbon to buy all, but I think I will buy nothing from it. I don't play this but I remember hearing about it on your blog last time! I still got to look into this hehehe! So sweet. I'd like to play such virtual doll rooms when my daughter was younger. We had lots of fun! ini game online ya ? aku liat banyak bgt yg maen, tapi ngag ngerti euy =_="